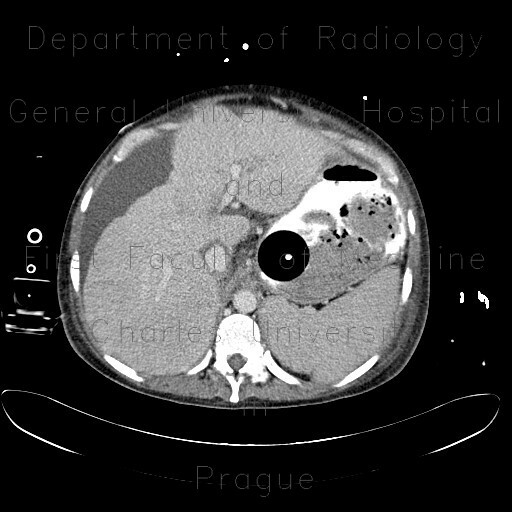 Patient with liver cirrhosis was admitted due to severe variceal bleeding. Segstaken-Blakemoore tube was inserted to stop intractable variceal bleeding. The tube is positioned correctly - the long balloon is in the oesophagus, the round balloon in the gastric fundus. The stomach contains several large blood clots and contrast which was injected through the tube. The liver has lobular contours, there is abundant ascites and enhancing veins that connect portal and systemic venous circulation. Note also rectal tube with the tip in the descendent colon.